Hey y'all! I am sharing a few thrifty new things I bought over the weekend. A couple weeks ago, I received a coupon in the mail from Lane Bryant for $25 off with no minimum purchase. Lane Bryant is a great store if you are on the plump fluffy side like me. They are a bit pricey for my taste, but I thought I might be able to find something on clearance that I could basically get for free. Mama had a $10 off a $25 purchase at JCP that she gave me since she wasn't going to use it. So, coupons in hand, I sweet talked the hubs into driving to Gainesville (about an hour away) for the day and do a little shopping on Saturday. First stop was JCP, where I bought this pretty Liz Claiborne top and gold leaf necklace. Here's a close-up of the fabric print. And here's a close-up of the leaf necklace. I love it and it will be a nice fall accessory. After JCP, we went to Red Robin for lunch and then on to Lane Bryant. The hubs went to Sears tool department while I went to Lane Bryant...lol! I was excited to see they had a rack of tops on clearance for $9.99 each. They were normally priced $34.99 (which I would never pay), so this was a good deal! Remember I had a $25 coupon with no minimum purchase, which left me $5 to pay for these three tops. Normally $105 for $5! SCORE...:) I think the yellow one will be pretty with my navy blue capris and a scarf. You can see the detailing on the necklines here. The purple and white one is just like the blue one. On the way out of the mall, I noticed Bath & Body had their hand soaps on sale again, so I stopped in and bought some fall scents. I put the Autumn Day in my bathroom and the Pumpkin Cupcake in the kitchen and they both smell heavenly! Dakota's bathroom got the Mountain Air scent but I haven't smelled it yet. I like to buy their soaps when they are on sale and they last a long time! And...since I was in the neighborhood and had my saver card filled and could get $10 worth of free merchandise, I stopped by the Learning Path (teacher store) and picked up a couple things there too. So, I saved $45 on all my products with coupons alone! All total and at regular prices, these things would have cost $217. With my coupons and sales, I got all of it for about $82! Talk about happy...:) I love good deals! OK....hope I didn't bore you to tears with this, and if you stuck around...thanks! I came home from work early today since I was so stuffy I couldn't enunciate....and felt really bad too. I have been resting this afternoon and am praying I feel better tomorrow morning! I appreciate each of you and always look forward to hearing from you. Well....we did it! Mama and I started walking again this past week and I am so happy that we did. It is so hot and humid during our summers here in Florida that it's almost unbearable to walk outside. The temps have been a little cooler recently, so I called mama last week and asked her if she was ready to get back on the trail and she said yes! I feel so much better when I walk a couple miles every evening. I have been so sick with my allergy and sinus issues lately and so tired from teaching kindergarten that I was beginning to get a little depressed. I do not like that feeling and every time I recognize it beginning to consume me, I try my best to find something to turn it around. Walking is one thing that does that! So...I have a few photos from our walks to share. I am not sure what these little flowers are....just weeds I think, but up close they are quite pretty! These tall purple flowers bloom here every fall. They are so pretty and I would love to pick some of them to put in a vase but I am afraid that I might be allergic to them! Sadie accompanied us the other day for a few minutes until my hubby came by and took her home. I am trying to train her to walk n a leash. She hates....um, I mean loves it! Doesn't she look happy? She was happy because we stopped for a second to take a photo of the purple flower above. She does not like the leash, but we will get there.......eventually! The zoom on my little camera isn't very powerful, but I wanted to show you the banana spider I spotted on our first walk. It was about 20 feet off the ground between two tree limbs. These things are very common around here. A few yards down the road, we spotted another web with not one, but two spiders in it. They were everywhere in the trees. I have never noticed so many of them before. We rounded the bend to the paved road and the sun was hitting the trees and making them glow. This photo just doesn't do the sight justice. It was so pretty. The yellow flowers in the photo below is Goldenrod. It would be one of the culprits responsible for my illness lately! I am allergic to this stuff....and it is everywhere......:( It would look pretty in an indoor arrangement too, but no way I'm bringing it in my house! These little lavender beauties were just closing up for the night. And these tiny yellow flowers are oh so pretty! As is this feathery lavender flower. We saw a deer yesterday evening. Again....my zoom stinks, so this is a horrible photo, but you can see her standing there. Not sure what these things are called. They are not edible, but they are really pretty little clusters of berries. I so enjoy these walks with mama. It's so nice to chat as we walk and just enjoy each other's company. After our walk yesterday, we came back to her house where my hubby and daddy were watching football. They had just finished watching the Florida State University/Boston College game and FSU won! Woo! Hoo! You may remember me saying my daughter graduated from FSU last year and is a true Seminole! The University of Florida/Kentucky game had just started so we watched most of the game with them. My niece, Shelby is a University of Florida Gator. I root for them too....except when they play FSU...lol! We enjoyed a yummy bowl of chili and a slice of toasted homemade pound cake mama baked yesterday. If you have never toasted pound cake and slathered a little butter on it, you don't know what you're missing. Oh so yummy! Perfect fall dessert too. Well, thanks for taking a walk with me...:) I'll be sharing some photos now and then. 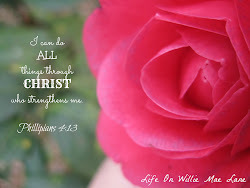 Prayers for a restful Sunday afternoon for each of you and a wonderful week ahead! Today is a very special day in my life.....the 24th anniversary of the day that my life was changed forever....the day of my amazing, kind-hearted, beautiful daughter, Miranda's birth! If you are blessed to have children, you know just what I mean. A week overdue and a second induction, 20 hours of labor only to dilate to 3 centimeters, she was born by cesarean section at 3:37 am, weighing 8 lbs 9 oz! Miranda was my first born and only child for nearly six years before Dakota came crashing into our world...lol! Life is forever changed when you have a child...your heart no longer belongs to you...it is instantly taken over & inhabited by your child. So much so, that the ability to live and breathe without my children in my world in unimaginable. So hard to believe she is 24.....I mean, just yesterday, she was this little girl running around in her hair bow shoes (what she called her flats with bows on them...:)) with her Toddler Bible in her arms and her nose constantly in a book. Not much has changed though.....although she did trade in the Toddler Bible for a regular Bible, but she still always has her nose in a book. Oh yeah...and she still loves flats! What better time of the year to feel God's glory than the fall. This season provokes nostalgia in me year after year. Fall always feels more like New Year's to me than the actual holiday. Maybe that is partly due to my being a teacher. My new year begins when students return to school towards the end of August until mid August of the following year. Fall brings with it, so many pleasures for me.....cooler temperatures, my favorite holidays, decorating my home for the season, soups and casseroles, yummy baked goods, family get togethers around a simple fire...toasting marshmallows for s'mores and roasting hot dogs, football games, beautiful colors, sweaters, and so much more. It fills me with hope.....excitement.....anticipation.....and joy. I wanted to share a picture I took of Sadie asleep in the truck earlier. We went to my mother-in-law's house for lunch and Sadie went with us. She is so sweet sleeping here in her snazzy new chevron collar I bought her. She is just precious and growing like a weed! This is how the first day of fall was here....rainy! I am not complaining though as we needed the rain. And...I'm really hoping it will wash some of the allergens out of the air! We had a downpour! It's still raining and I have to say it's one of my favorite sounds. As for fall decor, I still have to get my hubby to drag my boxes out of the shed. I did however buy a few floral picks for the metal cone I shared a week or two ago. I was going to try to come up with something unique and handmade to put in it, but I just don't have the time lately to be crafty and if I do, I've been too miserable to do it! So, I decided to take the easy route this time....and it's ok! I love it and am ready to get the rest of the house decorated. And if you didn't stop by yesterday, you may want to read this post. 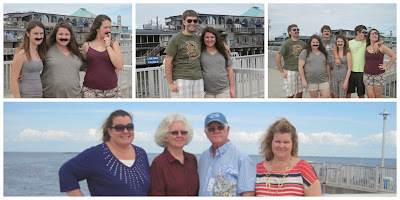 I shared a fun day with my family and posted some great photos. Prayers to you for a blessed Sunday afternoon and new week ahead! A Fun Day With the Family! Hello and happy Saturday! I hope this finds each of you having a wonderful weekend. I have thoroughly enjoyed mine so far. Earlier this week, my daughter, Miranda, text me and asked me if we had plans for the weekend. I told her no and she asked if she and her boyfriend, John could come down and spend part of the weekend with us. Well, of course I said yes! I never pass us the opportunity to spend time with my beautiful daughter...:) She wanted to come home and see everyone since her birthday is coming up next week and she already had plans for the weekend after her birthday. Well, I immediately started trying to decide what we could do on Saturday. 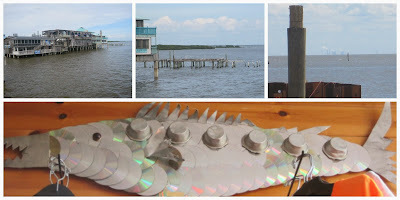 John had never been to Cedar Key, so I decided we would drive down there and spend a few hours. My mom and dad, my sister, Nancy, and her kids were all able to join us, so, almost the whole family got to go. My son, Dakota, had already made plans to go to Tallahassee (where Miranda lives) to the Florida State game with some friends, so they switched places for the day! I do wish he had been with us, but it was still a fun day! We were all hungry since most of us hadn't eaten all day, so first thing we did was went to eat. 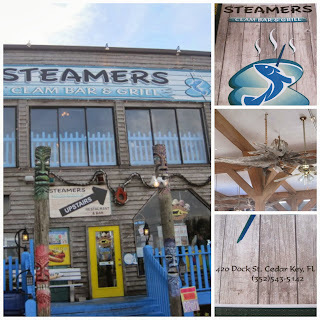 The place was called Steamers....see photos below. Here is the yummy food we had. Randa and John each ordered the crab cake sandwich and Joey and I shared a platter which included shrimp, scallops, and grouper. Yum! That's the dessert Nancy ordered for Randa....Peanut Butter Explosion! Below are a few photos I took from the pier. The first one is the back of the restaurant where we ate. The last one shows the nuclear power plant where my dad used to work. You have to enlarge it to see the smoke stacks in the distance. 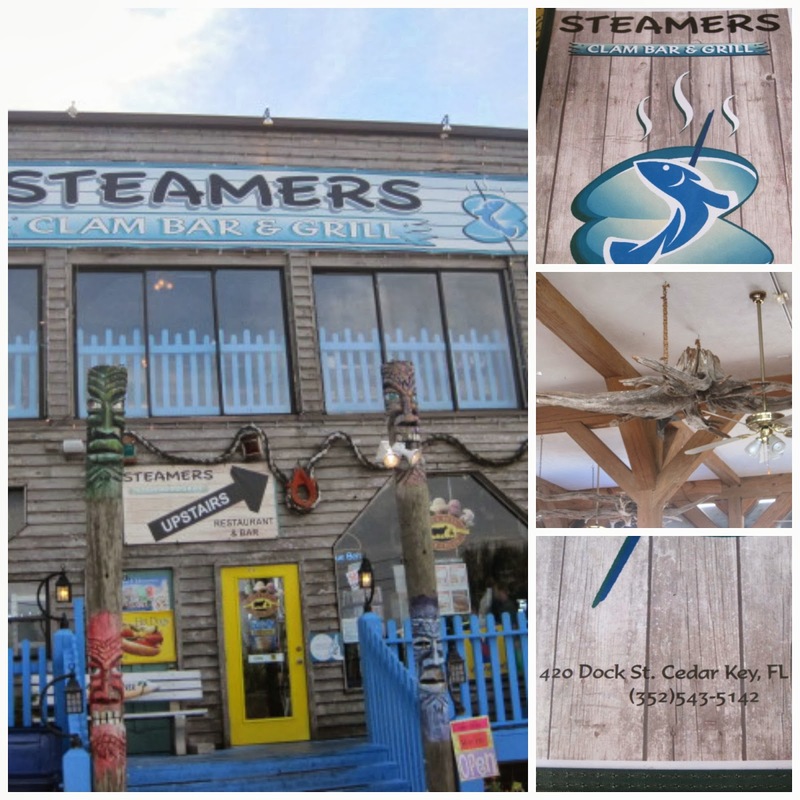 It is located in Crystal River which is about 50 miles from Cedar Key by land. 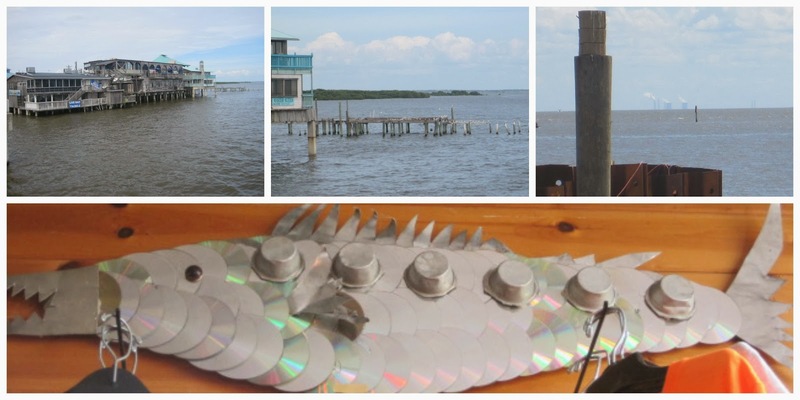 The bottom photo is a cool fish made from cd's, a muffin pan, and other metal parts. He was hanging in the restaurant. Below are a couple photos of the kids all goofing off in the fake mustaches Nancy stuck in Randa's bag. She's a nut! That's Nancy on the left in the bottom photo, my mom and dad, and me. Now, for some fun pix! Check out this adorable little vintage camper. 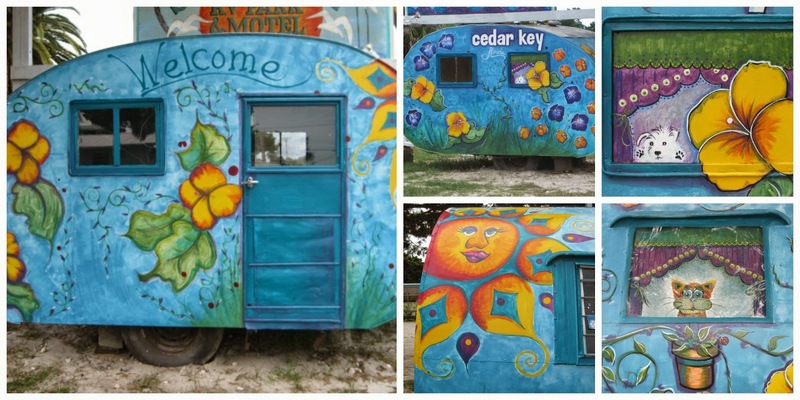 It is the welcome for an RV park in Cedar Key. Isn't is awesome? I love it....so whimsical! 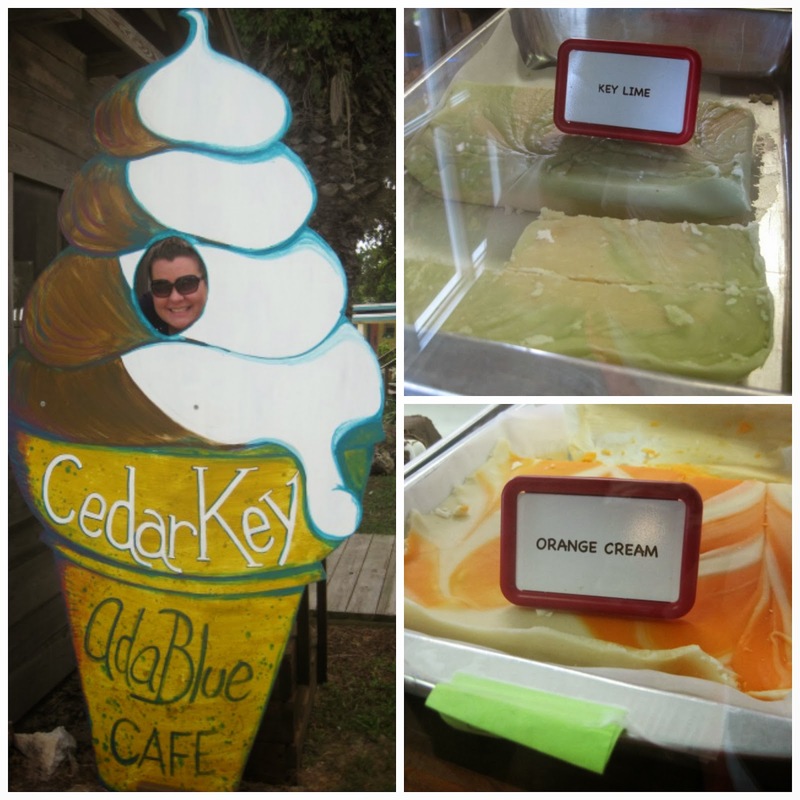 The RV park owners also own a little cafe and fudge shop. My sister wanted to stop in and buy some of their delicious fudge. I had fun looking around at all the whimsy on the porch. I love the way they built the porch around the huge old oak trees . 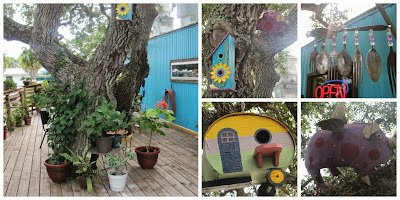 and check out the adorable bird houses and the purple, flying pig in the tree...lol! I talked Nancy into posing in the ice cream cone...:) Here are just a couple of the varieties of fudge they make. I tried a small piece of butter pecan and it was tasty! Fudge is so sweet and rich that it only takes a bite or two for me! Anywho, I ended up riding home with Nancy since we both needed to run into Wally World (aka Wal Mart) to pick up a few things. My nephews, Jake and Nathan wanted to go to the Yum Yum Shop for ice cream, so we did. 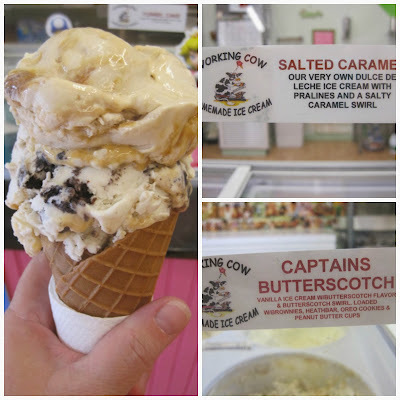 It is an adorable ice cream parlor in a nearby town. I just had to take a few photos to share. (enlarge to see them better). They have entire walls covered in pictures of people who have eaten ice cream there. The Blue Crew is a wall dedicated to pictures of people (mostly kids) who had the Smurf ice cream which is blue raspberry with marshmallows. My nephew Jake is eating it in the top photo. They also have a wall of people who have ordered the Pig Trough, which is 24 scoops of ice cream and all toppings...wet and dry. My son and two of his friends are on the wall. I took a picture of the photo on the wall. This was a couple years ago after Dakota broke his foot and had to have surgery on it. He looks so young here. I hope you enjoyed visiting Cedar Key and the Yum Yum Shop! 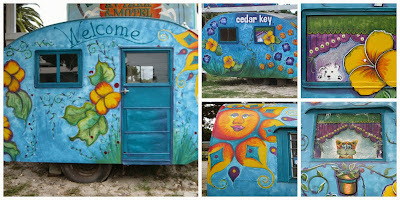 I hope to go back to Cedar Key before too long and take lots more photos. It is such a quaint little Gulf Coast town. We didn't have a lot of time today since John and Miranda had to be back to my house by 4:30 for him to whisk her away for a birthday surprise...:) He is such a sweetie! Have a wonderful rest of the weekend my friends! California Burlap & a Few Finds! A Valentine's Celebration in September? From Not Too Terrific Tan to Awesome Aqua! Tomato Pie & 74 Years Old!!! A Wedding, a Chalkboard, & a Song!